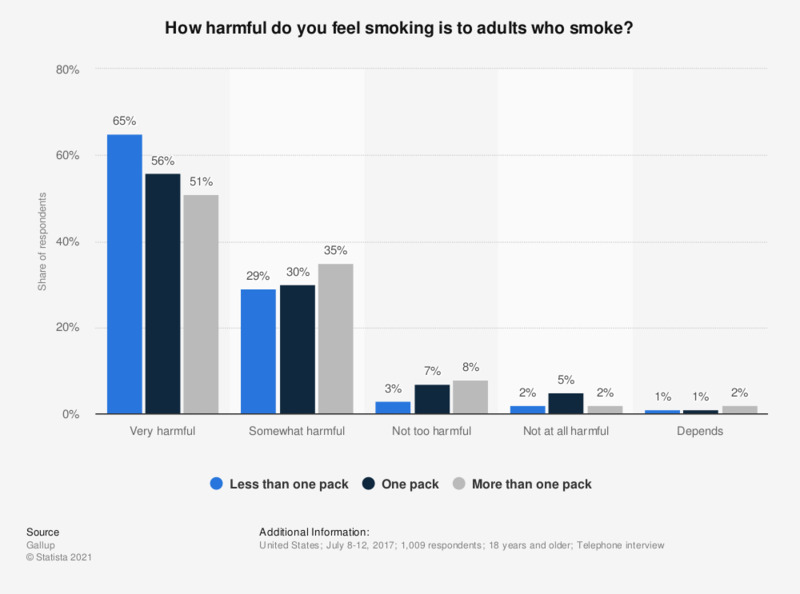 This survey conducted in 2017 shows how American adults feel about the harmfulness of smoking. 65 percent of the respondents who smoke less than one pack of cigarettes a day stated they believe smoking to be very harmful to adults. The source poses the question as follows: "In general, how harmful do you feel smoking is to adults who smoke -- very harmful, somewhat harmful, not too harmful, or not at all harmful?" Everything On "Health risk factors in the U.S." in One Document: Edited and Divided into Handy Chapters. Including Detailed References. Statistics on "Health risk factors in the U.S."
Does the fact that a person smokes make you respect them more, less, or does it make no difference to you? South Korea: What brand of cigarettes do you smoke?